← Hands up then, is anyone going to do God? Howard Zinn and the Myth of the Good War. As Remembrance Sunday approaches our thoughts will soon turn to the horrendous casualties of war, indeed the armistice date for me conjures up many ambivalent feelings. I consider the First World War a pointless loss of life, lion`s led by donkey`s a clear example of a bad war without a rationale or justification. But I honour the falling on both sides, the majority of whom were working-class people duped or compelled by a cruel system to do it`s bidding. The Second World War is different a “people’s war” fought to end fascism a noble endeavour to defeat the tyranny of the fascist jackboot. But have I by accepting this view of the Second World War as a worthy conflict, fallen victim to what Howard Zinn called the `Myth of the Good War`? Are not all wars by their very nature bad and could other ways of combating fascism have been found. 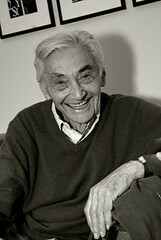 Howard Zinn knew about combat given his active service record during the Second World War, a subject he spoke about to Harry Kreisler in April 2001. He enlisted despite his entitlement to a deferment and rather than sit the war out opted to fly bombers, a role with the worst casualty rate of any of the other services. He bombed many countries in order to defeat Nazism and fascism the ugliest phenomenon in the world. Howard Zinn was a brave man and always led from the front. He told Harry Kreisler that his desire to defeat fascism transformed him into an “enthusiastic bombardier”. Zinn a brilliant academic also had a hinterland; he was twenty-seven years old when he went into full time education benefitting from the GI Bill and his life experience shaped his academic interest`s encouraging him to focus on historical themes hitherto ignored. And he has left a lasting scholarly legacy that concentrated on the people`s history. During the war Zinn was based in England and participated in bombing missions over Europe. After countless flights he was ordered to bomb the French town of Royan in Bordeaux, a futile military mission given that the war was all but over and the French town occupied by German troops who had been by-passed and simply waiting for the war to end. But the logic of war prevailed and the troops bombed and Zinn was informed prior to embarking on his mission that a “different type of bomb” would be deployed, which destroyed the German troops with napalm, while the French town was also wiped out becoming a victim of that great oxymoron of our time, “friendly-fire”. Zinn speaking much later and only a few months before his death from a heart attack, systematically analysed three American wars including the Second World War – a single conflict resulting in the loss of fifteen-million people. Victory in 1945 saw the demise of Hitler but Zinn argues that 1945 did not herald a brave new world. And more tellingly victory did not spell the end of fascism that evil doctrine is sadly very much with us. At the end of the lecture Zinn was challenged on two issues; regarding the attack on Pearl Harbour and the dropping of the nuclear bomb on Japan. To Zinn Japan`s conduct during this period is inexcusable clearly equating them with fascist Italy and Nazi Germany. Zinn teases out the issue and explains that the attack on Pearl Harbour (which I repeat is not excused) was a military attack on a military target that was a colonial possession of the USA. Indeed Zinn explains that a high ranking Admirable apparently advised before the attack that the USA withdraw from the region as “we don’t need it, it`s a possession of ours – and that Admirable was removed from duty”. During the lecture the intellectually combative Zinn was questioned about the nuclear bombing of Japan in 1945. He cites the text `The Decision to Drop the Bomb` to illustrate that there was no need to invade Japan to win the war and the expected loss of life would not have happened. He backs this observation up with reference to the `USA Strategic Bombing Survey` providing evidence that Japan would have surrendered in few months and the bomb was unnecessary. Zinn argues that the nuclear bomb was employed to bring the war to an early conclusion and the price paid was the death of a couple of hundred thousand people-innocent Japanese civilians. The historian questioned one of his detractors in the audience asking would America have been prepared to pay a similar price in innocent USA civilian causalities to bring the war to an early conclusion? –the answer of course is obvious. It would have been interesting to hear Zinn`s view on the Nazi invasion of the Soviet Union and the terrible devastation brought to an innocent population by the Nazi war machine – what alternatives other than war were available to the Soviets? However, the logic of war eloquently described by Zinn is also evident in this terrible phase of the war, as Anthony Beevor describes in his book `Berlin` the German civilian population later suffering terribly at the hands of the Soviet Army – especially the female population.